Our Harry Potter badges are super popular with book and movie lovers alike. 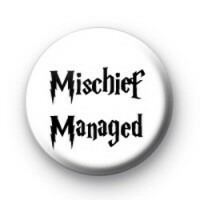 This black and white 1-inch Potter inspired badge has the phrase Mischief Managed written in a wizard font. Mischief Managed is a phrase used to close' the Marauders Map which makes it look blank, until the words, I solemnly swear I am up to no good are spoken, which activates it again. This Mischief Managed Badge would look great pinned to your coat or bag, make sure you take a look at all our other Potter inspired badges. Who is your favourite character from the Harry Potter books, we have a soft spot for Severus Snape.